Asus has long been seen as a top motherboard and graphics card manufacturer, but increasingly it's diverging out into a much broader space. We've seen it produce fantastic laptops and recently some excellent 120Hz monitors. It's also been quietly producing brilliant sound cards for the last few years, so it should come as no surprise that headsets are also on the menu. This Orion Pro is the latest headset from Asus and it's not a bad little offering, especially when you consider we've been playing with some seriously high-end headsets recently from Sony and Logic3. At £70 it's not exactly sitting at the cheaper end, but it's hitting the market with some impressive specs on its product sheet and is looking to offer a versatile headset that doesn't break the bank. 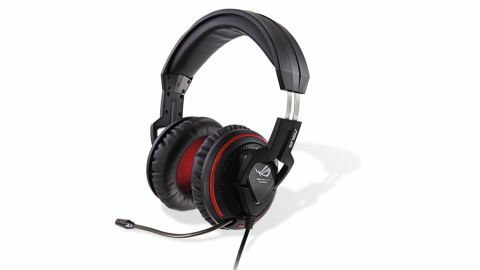 The classic red and black styling immediately denotes the Orion Pro's Republic of Gamer status, and the angular headset and USB soundcard scream Asus design. It's not style over function though, as the set sits comfortably on top of the head without crushing your ears inside the snug-fitting ear cushions. The passive noise cancelling isn't as effective as the faintly oppressive, brain-sucking, active setup in the Logic3 Ferrari cans, but is still pretty effective at creating a gaming bubble around your head. The stand out feature of the Orion Pro, and what separates it from the more basic Orion headset, is the bundled RoG Spitfire USB soundcard attachment. The 3.5mm mic and phone jacks from the headset itself plug into the USB dongle, which offers three different audio modes you can use separately or in conjunction with each other. These are all activated with a single touch and an LED highlights which ones are in use at any one time. The headphone amp feature is designed to boost in-game sound detail and is specifically set up for the Orion headset. In practice it's tough to hear what this setting really adds to the experience. More interesting is the virtual 7.1 surround sound - in-game it makes it much more obvious the direction from which things are coming. The final 'FPS mode' is ostensibly designed to bring out more sound detail in-game, but ends up mostly being about booming bass - the sort of thing you really want in a fast-paced FPS. Still, the audio clarity is impressive when you're gaming. These settings are a god-send if you're not just going to be gaming with the Orion headset. Knocking off the surround and FPS buttons makes listening to music a more comfortable experience than with them on. What is a shame is that it seems like there's some sort of dynamic volume setting running through the Spitfire as I detected some strange shenanigans when moving between different sound levels. It's a minor thing, but it can be very off-putting. Other than that niggle I've been very impressed with this headset, they're comfy for long gaming bouts, but that strange dynamic volume would keep me away.